When both Jim (Dad) and I met Gordon Bruce (Knockdhu Distillery Manager) at the launch of the Peter Arkle limited edition anCnoc Single Malt, we had no idea that it would lead to us working a few shifts at the traditional highland Knockdhu Distillery. Arriving at the distillery for the 1st of our 3 back shifts (2pm-10pm) and looking round the machinery and pipes, day one felt like an impossible task, to learn or even to just understand what the “Men of Knock” had been perfecting since 1894. When Ally (assistant Distillery Manager) introduced us to our expert for the day (Ian) I have to admit we both struggled to understand his broad north east Scottish accent, however after an hour or so we had adapted and tuned in. Ian was a wealth of knowledge, 20 years in Knockdhu he knew the place inside out. He never stopped moving for the full 8 hours, several times over the evening a few beads of sweat gathered on Jim’s forehead. The sheer amount of pipes, valves, guages and switches was mind blowing and to see Ian seemlessly move from one process to the next explaining all the way was exhausting to watch. Ian also coined a few memorable phrases – phrases I believe he must use to remind himself of processes, one of the best was, “If yir waashin then yir mashin”. 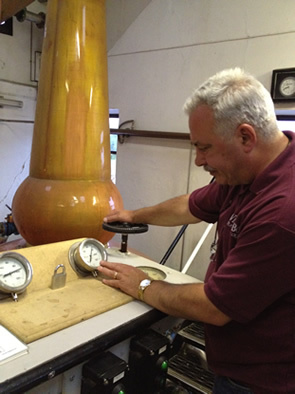 As day 1 came to an end it was starting to sink in the sheer complexity of the traditional distillation process. We headed back to our hotel in Keith with too much information in out heads and unsure if we could retain this till the morning. On day 2 we were pumped and eager to start shift no 2 – who knew but a lot of the info had stuck, I actually felt like a distillery operator, confident in the spirit I was making – pride was oozing out of us. We arrived and were please to see Gordon, Ally and Ian ready to fill us with more knowledge about their distillery and the process they use to make anCnoc single malt whisky. Now I felt much more in control and was eagerly checking and double checking readings, levels and temperatures (without being asked). I was thinking like a distillery operator. There was however one aspect I had a bit of a problem with, “The Boiler”, it was a 1960’s shuttle rocket launcher – it was a flame thrower from hell, and it made a LOT of scary, I’m going to blow up noises. I have to admit it scared the beejeezus out of me. Thankfully it is being replaced during the closed season – July 2012. – Note to Gordon and Ally, I will be back to check. The day ended with us working the full mash process (8 hours) – 3 waters and we also emptied the spirit still with the first of the spirit we had made. WE HAD MADE SPIRIT, it is now ready to be placed in a cask for the warehouse. Confident and ready to learn was the motto for Day 3, fully charged and ready to mash on our own, here we go, we also had a new expert in charge, Ali. 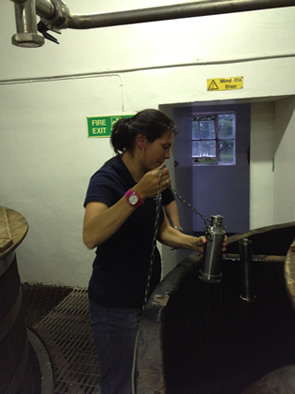 Other highlights of day 3 were stenciling a cask and manually measuring the readings from the spirit receiver, checking temperature and alcohol levels. We both feel very priviliged to have had this opportunity and to have been able to work alongside some traditional Whisky makers. We love to drink and taste Whisky but how many of us will have the opportunity as a non manual worker (office bound) to see and operate a barley mill, a 5 tonne mash tun, 6 douglas fir wash backs, a wash still and a spirit still. Writing this now I cannot put into words the amount of information and knowledge I squeezed out of the guys at Knockdhu, I asked everything and got answers for the lot. 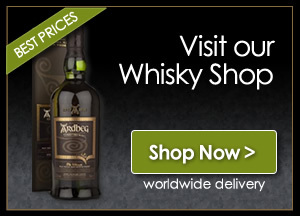 A true diamond of a distillery with men to match. 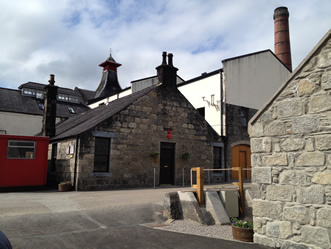 The kindness and generosity displayed at this distillery was immense. One question I asked most of the men was what they enjoyed the most about working at Knockdhu and they all answered “the team is great, just a great bunch of guys to work with”. NOTE: our trip to Knockdhu last week coincided with a very historic event at the distillery, there will be a full blog post on this next week. Aren’t the men of Knock great… nice write up as well. Good to hear that the boiler is being replaced… any plans for the stills?